Have you seen Club Couture's Capsule collection? Inspired by things women young at heart like to wear, this collection is a perfect mix of pieces for party and play. It's filled with shades of pink and grey - Light pink, dove grey, white, cream, black, fuchsia. 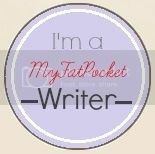 All my readers get a storewide discount of 10%! You can use the discount code HOLLYJEAN up to 2 times. So any 2 occassions you shop at ClubCouture.. you can take 10% off your bill! 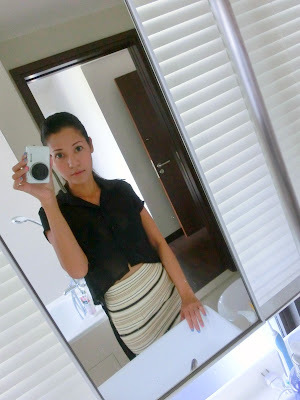 For this look, I'm wearing the High Waisted Stripe Skirt from the Capsule Collection. This skirt is surprisingly very slimming! I'm always a little apprehensive about horizontal stripes and a tight bodycon fit when it comes to skirts because I have quite chunky thighs. I guess the thin lines, and the high waist of this skirt works very well to skim the figure. I've paired it with the Jet-Set Sheer Blouse from the Holly Jean Debut collection which I designed a few months ago. And the Faith Wedge Court Shoes in Brown from ClubCouture's extensive shoe collection. This Capsule collection has loads of accessories and bags ... from quilted totes to satchels .. and my personal favourite... vintage looking hardcases! So chic! 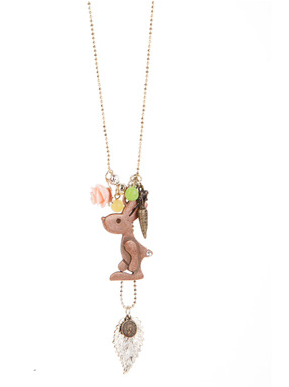 This cute Hippity Hop Long Necklace is from their Flair collection too. 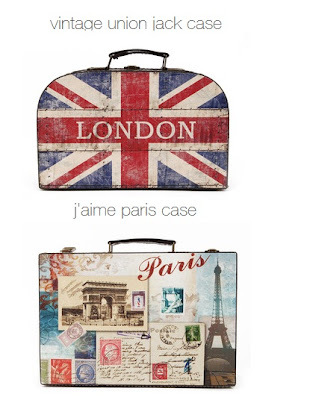 It adds to the playful and cheerful look of any outfit. One last thing to show you... this cute colour block skirt with the trendy neon pink trim is the Summer Skirt with Pockets from their Premium collection. Your 10% Discount is applicable to all collections at ClubCouture. So Happy Shopping! Do u think u will transition your style to more mature sleek style anytime soon? kfc doesnt sell fried drumlets anymre:( random & outdated news but :(:(:( i rmb you saying you liked them too! Maybe when I get my first wrinkle. Considering my skin type is dry, it may be sooner than later.. Ack. For now I still prefer comfy casual bright and fun clothes. KFC drumlets no moreee? Noooo! :(. Popeyes drumlets quite tasty too.